There is no end to self improvement, and indeed I myself have many gaps to fill and things to learn. In the pursuit of new skills and just general fun and amusement, myself and my friend May signed up for a class. There is a Collective in Sydney called Laneway Learning, who host classes on, well pretty much everything you can think of; craft skills and just down right left field randomness. There are your pottery and gardening classes, and there are also your sock puppet variety’s. I think the best one I’ve heard of was a class to learn the dance routine featured in Micheal Jackson’s Thriller music video. Right?! Left. Field. 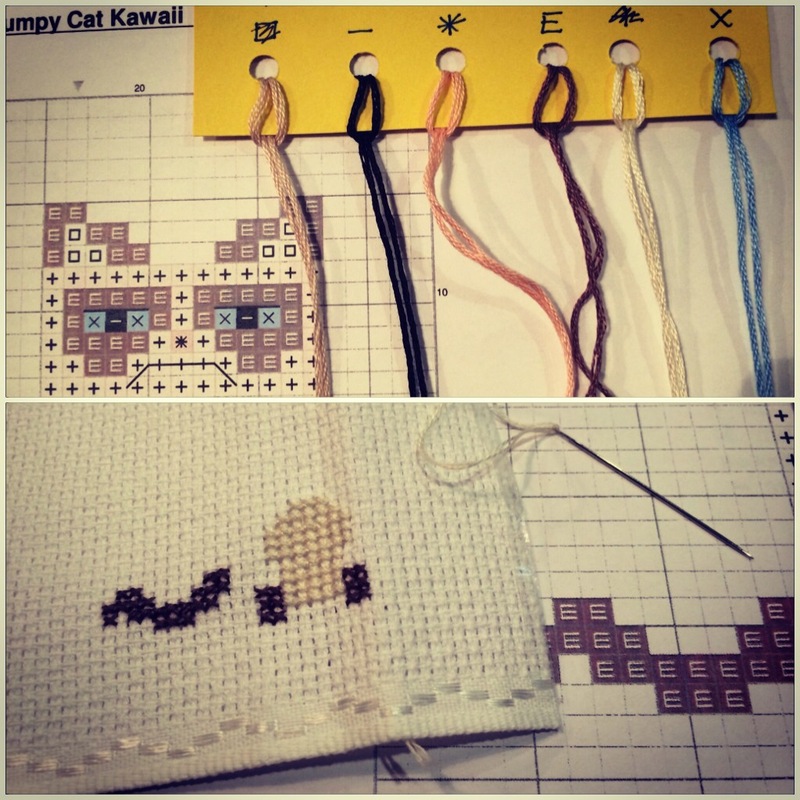 So, I had long since heard of these classes and kept thinking to myself, I should do one already, but had thus far failed to get around to it, when my friend May sent me a link to a Grumpy Cat Cross Stitch class. A (nother) fellow cat lover, it was sent in the vein of a joke amidst ‘bahah isn’t this just riddiculous‘ type comments. I earnestly replied to her: in all seriousness though, shall we do it? We were both enrolled within the half hour. I have only participated in cross stitch once, as a child spending a school holiday with the grandparents I was under grans beady instruction and completed a rather naff picture of a hot air balloon. My interest was waning long before finishing, which in the end became more of a must reach goal then an actual desire to see it completed. I have not counted stitches since. These days however I have a fairly regular relationship with my needles and thread, sewing my loud colorful necklaces, and having just worked on my slightly random commission of making a baby blanket. I think it’s safe to say I am in somewhat of a sewing zone. 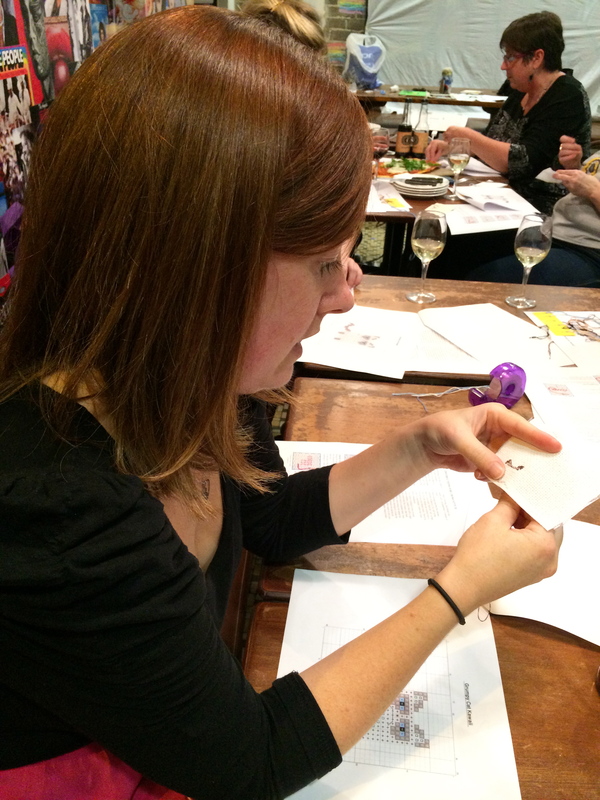 Thus come Cross Stitch class night I was an eager pupil ready to learn and already impatient to be making progress. Patience, I quickly learn, is a necessary skill for Cross stitch. Carefully detaching 2 strands from the 6 in the thread, finding the center point in the abundance of minuscule white squares, and counting counting counting stitches. Five across, then two up and seven across. Consult the pattern, how many in this row?. The kind of thing one can do while listening to the TV, not watching it, and debate-ably not drinking during, those squares are damn small. The modern hilarious and teeny image of Grumpy cat comes to life, the small size meaning progress gets made fast and the whole pattern only takes me 2 hours to complete. And he’s a damn sight more interesting looking than that bloody rainbow coloured hot air balloon. Think I may have found my new favorite medium to work in….for now anyway. Am already Googling other patterns out there, and planning a weekend trip to Spotlight for some supplies. Watch this space. Check out the Laneway Learning site to find your own kooky desired skill.